All the gold in the world isn’t enough to save a fundamentally flawed political system. Any system based on unsustainable political promises backed by endless fiat currency printing in a vain attempt to bring them to fruition is doomed from the start. Sound familiar? The only variable that ever changes is the timeline. 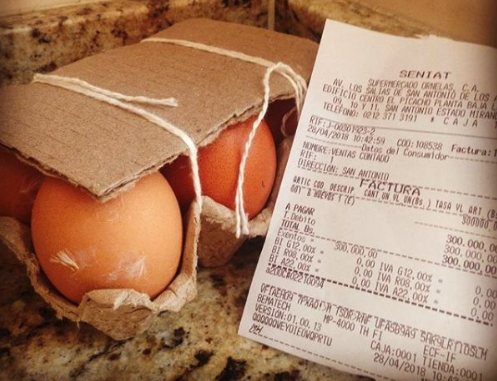 In Venezuela 6 eggs cost 300,000 bolivars. Monthly minimum wage: 392,646 bolivars. Placed in charge of mining activities, the army has delivered approximately $100 million in gold to the Central Bank of Venezuela in Caracas. The country desperately needed those revenues after its once-plentiful oil reserves plummeted following nationalization of the industry by then President Hugo Chavez. Once the government seized the gold mines, production fell drastically, from 11 tons annually from 2005 to 2009 to a mere 500 kilos a year since 2015.